The internet is full of feminist quotes falsely attributed to Gloria Steinem. Gloria Steinem, fake quote magnet. I want any young men who buy a gun to be treated like young women who seek an abortion. Think about it: a mandatory 48-hours waiting period, written permission from a parent or a judge, a note from a doctor proving that he understands what he is about to do, time spent watching a video on individual and mass murders, traveling hundreds of miles at his own expense to the nearest gun shop, and walking through protestors [sic] holding photos of loved ones killed by guns, protestor [sic] who call him a murderer. Most versions of the quote, including those circulated by high-profile users like Karlie Kloss, attribute it to Gloria Steinem. The venerable activist, however, didn’t come up with it herself. As Gabriella Paiella of the Cut observed this week, the most Steinem did was post it to her Facebook page in 2015 as part of a list of “Top Ten Things I Want For Christmas.” “This riff is not mine,” she added, “It’s on the Internet.” Just where “on the Internet” the righteous tirade originated isn’t clear; the trail goes cold before Steinem’s Christmas list. There’s nothing unusual, to say the least, about a quote being misattributed online. The odd thing is how often Steinem finds herself the beneficiary of such errant citations. Call her the feminist Mark Twain: a figure whose reputation for pithiness is so illustrious that new or catchy sayings are retroactively attributed to her. In a book about the origins of oft-misattributed quotes published this spring, a writer who uses the pen name Garson O’Toole identified this kind of figure as a “host” for quotes they don’t deserve credit for. Hosts tend to attract quotes that “conform to his or her character or accomplishments,” O’Toole writes. Most are male: Twain, Albert Einstein, Winston Churchill, and Yogi Berra, to name a few. Just a few are women, including Dorothy Parker and Marilyn Monroe. It’s time to add Steinem to their ranks. As it turns out, none of these can be clearly attributed to Steinem. The first has been percolating in various forms since the late 1970s, according to O’Toole’s site, Quote Investigator, which is invaluable on such matters. The “truth” line started appearing in this exact form in the early 1990s, but variations of the zinger—itself a twist on a Bible verse—have circulated since the 1970s. Steinem herself seems to have first used it in a 1998 keynote address at a Stanford University “Herstory” event. The second is arguably “Steinem’s” most famous quote, but she herself has taken pains to credit Irina Dunn, an Australian journalist and politician, who coined the phrase back in the 1970s. Compilations of Steinem quotes are a staple of online content targeted to women. Pinterest is bursting with her bon mots set against photos of beaches, sunsets, and vintage photos of the activist herself. Elle gathered 81(!) of her quotes and “epic one-liners” in honor of her 81st birthday a few years ago. The internet’s obsession with Steinem’s inspirational quotes makes sense: Over the course of roughly 50 years of activism, she has become something like a cardboard-cutout icon of “Feminist” in the way that, say, Albert Einstein has become the icon of “Genius.” An empowering quip becomes that much more inspirational if it’s thought to come from the living embodiment of pop feminism. But once you start prodding, many of the attributions start to stink like a fish riding a bicycle. “A pedestal is a prison, like any small space”? Not exactly. “If men could get pregnant, abortion would be a sacrament”? No. “Some of us are becoming the men we wanted to marry”? That one is tougher to trace, but a radio diary that aired on a nonprofit station in New York used a version of the phrase as early as 1972. 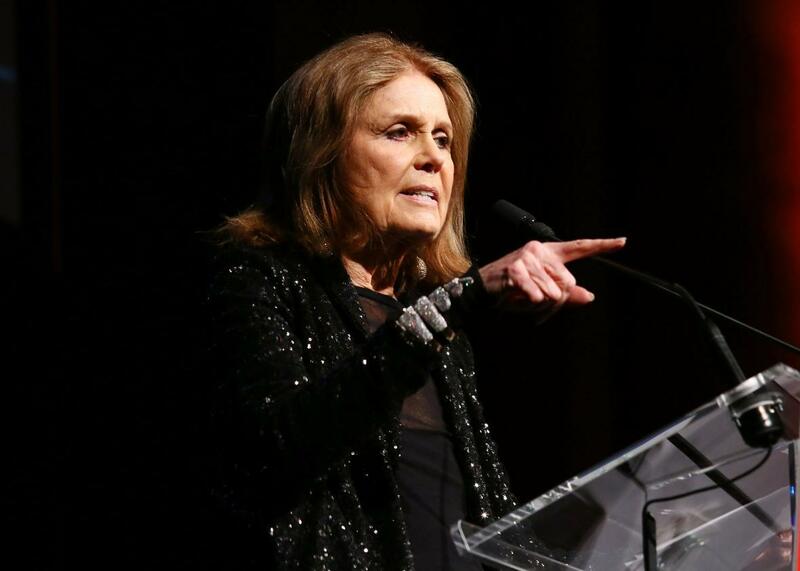 Steinem herself often puts a version of quotation marks around the comment: “There’s a saying now, We are becoming the men…,” she told Helen Gurley Brown in an interview. In a 2004 speech, she referred to the quote as an old women’s movement “slogan”—again, a subtle distancing that suggests she may not have coined the phrase herself. To be fair to Steinem, she has been extremely adept over the years at identifying “sticky” quotes, perhaps punching them up a bit, and disseminating them more widely than they ever would have spread as mere folk sayings. More importantly, she has been quite assiduous about directing credit where it was due, or at least deflecting it away from herself. True, she has occasionally been hazy about her sources, crediting one line to an “elderly Irish woman” cab driver in Boston, and another to an anonymous black Southern feminist. But that still makes her a much more responsible quote disseminator than many of her online fans.